When you need a robust and reliable connection, locking HDMI cable is your insurance policy. 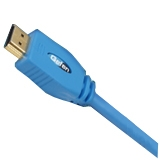 Due to HDMI's small form factor it is prone to signal loss and intermitency in active environments. Locking cable solves this problem entirely, giving you a crystal clear picture you can count on every time. Now featured in retail friendly packaging.